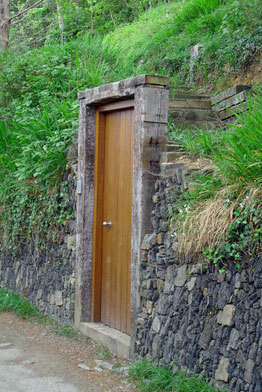 I took this picture of a wooden door built into the Irish countryside back in May 2008. After I snapped the picture, I stood there and contemplated the door’s purpose. While this door was beautifully crafted and made of solid wood, I had determined that its placement in the stone wall was totally pointless. Clearly anyone could climb up the stone wall and bypass the door altogether. As I pondered this on my solo hike through Kinsale, I never once tried opening the door. Instead I left it, untouched and unopened. Was there a connection to the fact that I was in Ireland by myself because I had just broken up with the man I thought I was going to marry? Yes. The door represented something that I would not, could not, realize until many years later: fear prevented me from going through to the other side. I walked past it because I did not think I had the right nor the courage to open it. Amazingly, we all do this, whether with groceries or paint or with the stories we feel determined to share. We do this with our love, with our sense of truth, even with our pain. It’s such a simple thing, but in a moment of ego we refuse to put down what we carry in order to open the door. The wooden door in Ireland that I walked past two and a half years ago would not have stayed closed were I to walk by it today. I would have at least tried the door handle to see what it led to. But back then, I was unknowingly “carrying” too much. Too much pain, too much sadness, and too much fear. In times of pain, we often don’t realize that the burden we carry holds us back. Our wounds are raw, so we play it safe. We don’t take risks. And we miss out on amazing opportunities. Ask yourself this: what is it that you’re afraid of saying or doing? What can you “let go of” in order to open a new door in your life? After my very painful breakup in 2008, I realized that I had been afraid of talking to my ex about what I truly wanted and deserved in my life: marriage and a family of my own. In my current relationship, I now understand that it’s okay to “open that door” and talk about it. What you find on the other side may be even more amazing that you could have ever imagined. I love the picture of the mysterious door in Kinsale. It brings thoughts of Hobbit holes or the painting I have in our guest bedroom, which shows similar doors in the landscape (I don’t know if you remember it – but it’s a fav of Megs). I got to thinking about whether I would open it or not and decided I wouldn’t, since subconsciously I would fear what I might find inside. That you’ve come full circle in your awareness since then shows your true strength of self by conquering your fears head on and turning them into opportunities. Stand up and take a bow – you owe it to your “self” and are a real inspiration to me!